Textiles are very much on trend this season and extremely popular out on the road. 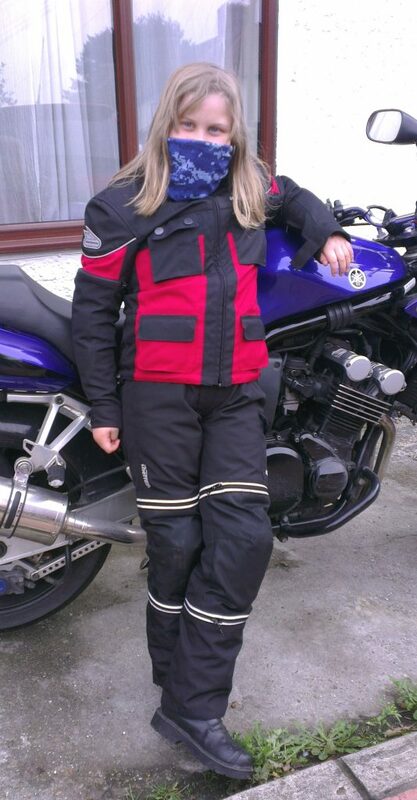 Our model wears a vintage Hein Gericke Sheltex jacket with matching trousers (ebay, £20-30), RST MX Boots (ebay, £15). The look is then finished with a Hoo Rag ‘blue digital camo’ scarf ($16) to accessorise. The children’s Hein Gericke combo is a miniature version of the adult line, featuring the same removable lining, waterproof protection, CE armour and pocket for a Hiprotec back armour insert. However it also has zips in the arms and legs for adding length as the wearer grows. The trousers also have an elasticated waist and braces.